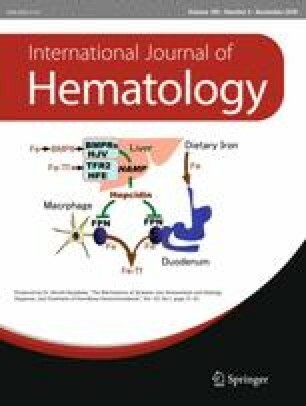 Cytoreductive therapy is used in high-risk essential thrombocythemia (ET) to reduce risk of thrombohemorrhagic complications. Anagrelide is an orally active, quinazolone-derived platelet-lowering agent approved for first-line treatment of high-risk ET in Japan. Long-term safety and efficacy data were collected from 53 Japanese high-risk ET patients (Study 308); 41 patients who completed Study 308 entered this phase 3b, open-label extension (Study 309; NCT01467661). Reductions in mean platelet counts occurred throughout the study, from 1021.6 × 109/L (at Study 308 baseline) to 675.4 × 109/L at final assessment. At month 48 (since Study 308 enrollment), mean platelet count was 444.5 × 109/L in the 10 patients who completed 4 years of therapy. Overall, platelet counts decreased from 1088.3 × 109/L at Study 308 baseline (n = 33) to 473.5 × 109/L at final assessment (n = 31). Long-term platelet count reductions were maintained without marked changes in mean anagrelide dose. Anagrelide was generally well tolerated, with anemia (54.7%) and headache (49.1%) as the most frequent adverse events. These findings indicate that anagrelide effectively reduces platelet counts in high-risk Japanese ET patients, with titration resulting in a well-tolerated, effective and sustainable dose. In conclusion, these results support anagrelide administration to high-risk Japanese ET patients using individualized dosing strategies defined in instructions previously approved in Europe and the USA. Study carried out at: Department of Hematology and Oncology, Osaka University Graduate School of Medicine, C9, 2-2, Yamada-oka, Suita, Osaka 565-0871, Japan. The authors thank the patients and acknowledge the contribution of all investigators who participated in this study. The study was sponsored by Shire Pharmaceutical Development Ltd, Basingstoke, UK. Under the direction of the authors, Peter Birch and Rachel Brown of ACUMED, an Ashfield business, part of UDG Healthcare plc, provided writing and editorial assistance funded by Shire. All authors reviewed the manuscript drafts and approved the submission for publication. Yuzuru Kanakura: grants from Kyowa Hakko Kirin, Shionogi, Chugai Pharmaceutical, Pfizer, Eisai, Astellas, Nippon Shinyaku, Alexionpharma, Bristol-Myers Squibb, Toyama Chemical, and Fujimotoseiyaku. Yukari Shirasugi: honoraria from Novartis. Hiroki Yamaguchi: none. Michiaki Koike: none. Takaaki Chou: honoraria from Celgene, Novartis, Takeda, Bristol-Myers Squibb. Shinichiro Okamoto: none. Henri Achenbach: employed by Shire, stock or other interests in Shire. Jingyang Wu: employed by Shire, stock or other interests in Shire. Chiaki Nakaseko: none. European Medicines Agency. Xagrid summary of product characteristics. 2016. http://www.ema.europa.eu/ema/index.jsp?curl=pages/medicines/human/medicines/000480/human_med_001153.jsp&mid=WC0b01ac058001d124. Accessed 6 Oct 2017.